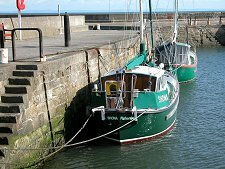 Musselburgh lies just five miles east of Edinburgh and is a strong contender for the title of Scotland's oldest town. It was first settled by the Romans in the years following their invasion of Scotland in AD80. They built a fort a little inland from the mouth of the River Esk and bridged the river here. In doing so they established the line of the main eastern approach to Scotland's capital for most of the next two thousand years. The bridge built by the Romans outlasted them by many centuries. It was rebuilt on the original Roman foundations some time before 1300, and in 1597 it was rebuilt again, this time with a third arch added on the east side of the river. 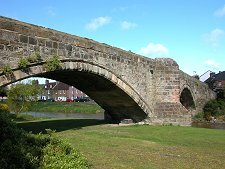 The Old Bridge is also known as the Roman Bridge and remains in use today by pedestrians. To its north is the New Bridge built in 1806. This in turn was considerably widened in 1925. 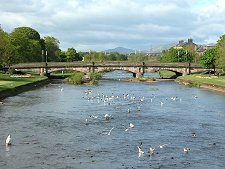 Musselburgh has other bridges. Perhaps the oddest is the "Electric Bridge". This was a road bridge built a couple of hundred yards north of the New Bridge in the 1960s to allow the transport of the turbines to the (since demolished) power station then being built at Cockenzie. Once used it was offered for a nominal sum to the Town Council, who turned it down. 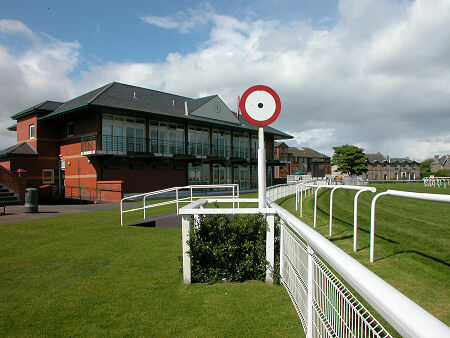 Access to it is therefore barred by gates that are only opened on race days to allow more direct access to Musselburgh Racecourse from the west. Other recognisable parts of Musselburgh began to take shape in the 1500s. 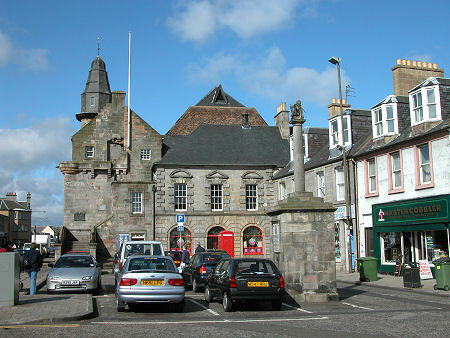 The castle-like Tolbooth which still dominates the High Street appeared in 1590. The earlier tower incorporated at its west end seems to have been built under Dutch influence, probably at the end of the 1400s. 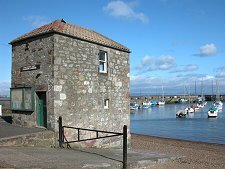 This was one of the few buildings in Musselburgh to survive a sacking by Henry VIII's English army during the "Rough Wooing" in 1544 (see our Historical Timeline). 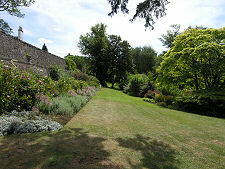 The late 1500s also saw the building of Pinkie House, to the south east of the High Street. 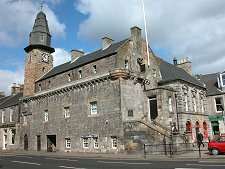 By 1690 Musselburgh had a larger population than Leith, with a high proportion employed in the area's woollen mills and coal mines. Meanwhile, a fishing harbour had been established at Fisherrow, to the west of the River Esk. 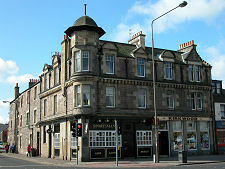 Leisure also became increasingly important to Musselburgh. 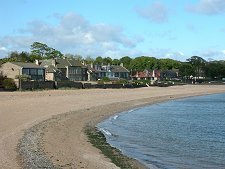 Proximity to Edinburgh, a nice seaside location, and increasingly good transport links led to Musselburgh's rapid growth as an upmarket dormitory and resort. A golf course was in use to the east of the town at least as early as 1672, and this has been recognised as the oldest in the world. It may actually date back much further: it is said that Mary Queen of Scots played here in 1567. In 1817 horse racing came to Musselburgh Links. Since then the nine holes of the Musselburgh Old Course have been contained within the racecourse. Over the years the Old Course has been home to many golf clubs, and the Open Championship was played here six times between 1874 and 1889. Visitors are welcome, and can hire traditional balls and hickory golf clubs to get a real feel for the early days of golf. The club can be contacted via their website. 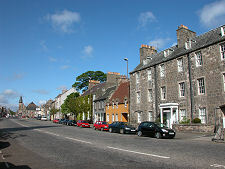 Modern Musselburgh was bypassed by the A1 as recently as 1987, taking it off the main road into Edinburgh for the first time in 1,900 years. But it remains a busy town whose fortunes and property prices have been strongly linked to the the economic boom in Edinburgh. 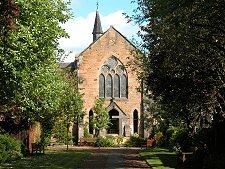 It also remains an attractive town with many interesting buildings, a racecourse, a harbour, and spectacular views across the River Forth and along it towards Edinburgh: plus its own stately home, Newhailes, and the attractive Inveresk Lodge Garden. The most recent addition to the town lies close to the A1 bypass between Musselburgh and Edinburgh. 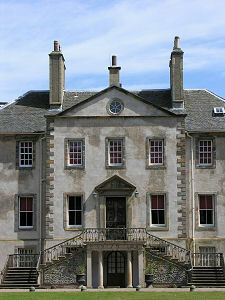 In 2007 this became the site of a new campus for Queen Margaret University.